It's four powerhouse tales in one colossal comic, as some of comics' most legendary talents launch new tales of Firestorm, Metamorpho, Metal Men and Sugar and Spike-that's right, Sugar and Spike! 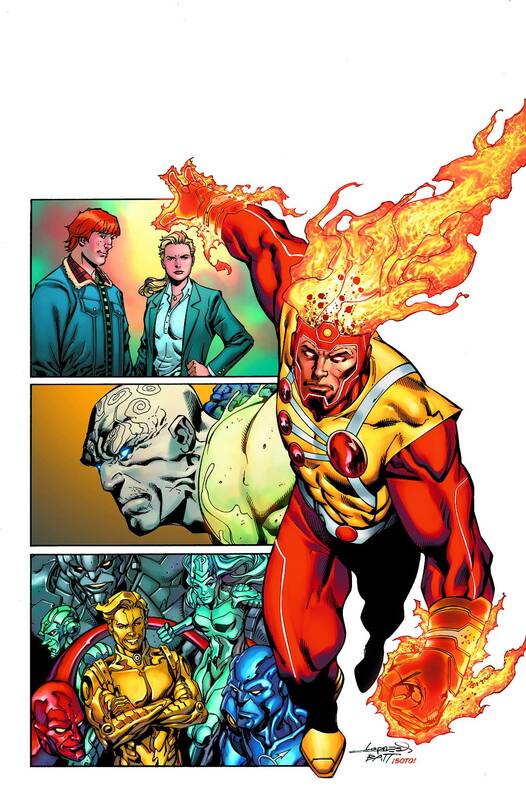 FIRESTORM Written by GERRY CONWAY Art by EDUARDO PANSICA and ROB HUNTER Firestorm is back! To save Jason Rausch, Firestorm will need to retrieve Danton Black's stolen research from Professor Stein's lab. But if Jason can't fuse with Ronnie by the Firestorm Protocol?who can? METAL MEN Written by LEN WEIN Art by YILDIRAY CINAR and TREVOR SCOTT Doctor Will Magnus' Metal Men may be the next step in robotics technology, but when the mysterious cyber-terrorist known only as Nameless comes after them, they may have met their match! METAMORPHO Written by AARON LOPRESTI Art by AARON LOPRESTI with MATT BANNING Metamorpho-a prisoner of millionaire industrialist Simon Stagg! Now, the only person who can save him is Stagg's beautiful daughter, Sapphire!? But can they defeat Stagg's prehistoric bodyguard, Java? SUGAR & SPIKE Written by KEITH GIFFEN Art by BILQUIS EVELY The last time we saw Sugar and Spike, they were still in diapers! Now, they're grown up, and they've become private investigators who specialize in cleaning up embarrassing problems for the DCU's greatest heroes. Sugar & Spike's first assignment: retrieve a cache of Batman's retired costumes that have been stolen by Killer Moth!